Easter is upon us. Only few days away! For this Easter season I am excited to celebrate with my 15 month old. So far my husband and I have planned on doing a mini Easter egg hunt, with the eggs out in the open of course, and I know that my daughter is going to love it because a) she loves surprises and b) she loves candy! Something that my husband and I did recently to start celebrating the Easter season was to make an Easter themed breakfast. It was not only delicious but a great way for my husband and I to bond and have a fun time making food in the kitchen with each other. 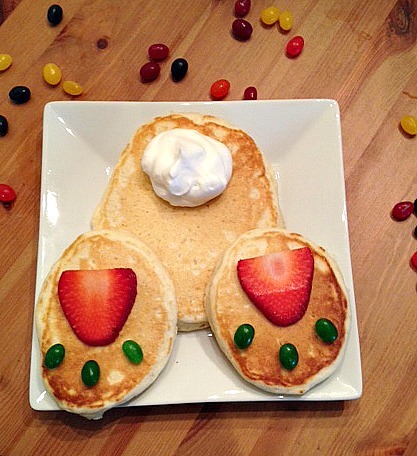 We made two things for our Easter breakfast, a bunny face made with eggs and a rear of a bunny made with pancakes. I think they turned out really well but check out for yourself! 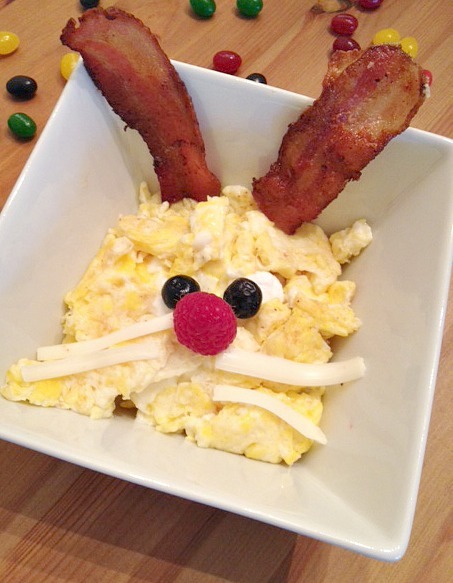 The bunny face was scrambled eggs on the bottom, one slice of crispy bacon cut in half for the ears, string cheese for the whiskers, raspberry for the nose, mini marshmallows for the whites of the eyes (I squished two together for each eye to make them wider than the blueberries) and blueberries for the blue of the eyes. 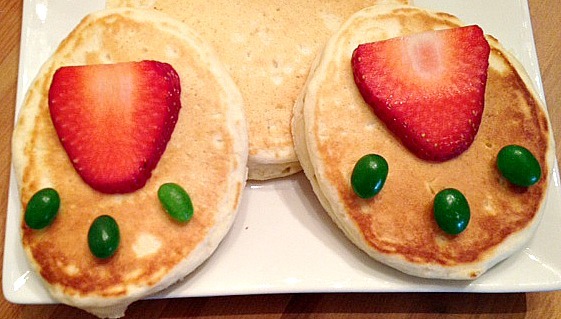 The bunny pancakes were not as easy but were still fairly simple. First I had to make the pancakes. I made one larger one for the bottom of the bunny and then I tried my best to make two small ones that were of a similar size and shape for the feet. For the pads of the feet my husband cut two slices of a strawberry from the middle the middle of the strawberry and I used three Star-burst jelly beans for the toe nails. Then for the tail we used homemade whipped cream, we used lime zest instead of vanilla which turned out a lot better than I thought! This was super easy and fun to eat! It was a great way to kick off the upcoming holiday! I got the ideas from two links I found on Pinterest. What are your ideas for an Easter Breakfast? What are some fun Easter traditions that your family has? Are you planning on doing anything new this year for Easter? What is your favorite part about Easter? These are cute ideas. I would have loved to have done this for the kids this last Easter.